Anyone wanna buy a kidney? 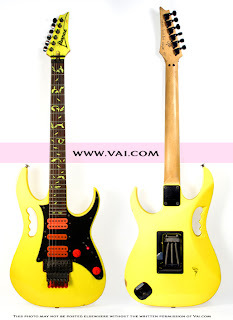 Cos I need to raise funds quickly to participate in some auctions coming up on eBay courtesy of one Mr Steve Vai. Steve has been clearing out the garage and it’s time for a winter sale. Among the goodies up for grabs is a Jem777VDY – used both live and in the studio, this yellow Jem was given to an assistant of Steve’s a few years back. In recent times this guitar came back into Steve’s possession, and we now make it available for you. We are open to serious offers on this guitar ahead of it appearing on Ebay. Email us at talk2us[at]vai.com with offers or inquiries. Also up for grabs are a set of DiMarzio prototype pickups, Jem necks, used pedals, straps, amps and more! Check back in the coming days for a list of gear and photos.